- No matter how unruly your curls, the ceramic coating gives you silky straight hair that's easy to style. 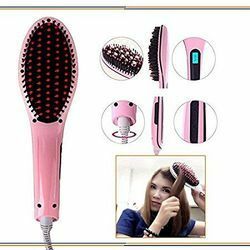 - The Hair Brush is a wonderful ceramic brush that straightens your hair easily without damaging or burning it. - Perfect for hair of all types, this brush features ceramic-wrapped bristles that warm up quickly. - It is the quick and easy way to get salon quality, perfectly straight hair. 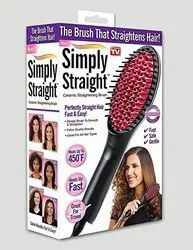 - Simply Brush Hair, And This Straightener Delivers Gentle, Even Heat Around Each Strand. No More Flattening Or Frying Your Tresses. - No Matter How Unruly Your Curls, The Ceramic Coating Gives You Silky Straight Hair That''''S Easy To Style.